Bold, robust and flavorful – our blend of American made Rowland tobacco blends offers an intense smoking experience and rich flavor and aroma. Each blend of American pipe tobacco at Indian River Tobacco is made by experts – blended and balanced with natural flavors to produce a delicious, pleasant finish on the palate with each smoke. 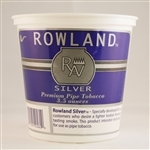 If you’re looking for bold flavors without sacrificing smoothness, American pipe tobacco from Rowland delivers rich flavor without harshness, making for the finest smoking experience. This premium pipe tobacco is a balanced aromatic blend of burley, flue-cured and oriental tobaccos has been developed for our customers who prefer a conventional American smoke. At Indian River Tobacco, we aim to ensure that every one of our customers enjoys a unique, pleasant smoking experience. Our blends of balanced American pipe tobaccos are selected for your smoking enjoyment, available in a variety of sizes, sealed and shipped quickly to ensure you get the best tobacco possible. Browse our wide selection of premium tobaccos below, and find the perfect match for you. Get FREE shipping on all of our American tobacco products!